First of all it’s important even as current events draw our attention to the East or to the South of NATO space, to remember that NATO is an Alliance in all directions. So here at the NATO headquarters we often remind ourselves that we are a 360 degree, that is a complete circle when we think about challenges to the Alliance. So the far north is part of that 360 degrees.Thanks to very solid allies like Norway we don’t have a serious security challenge today in the far north. NATO watches very carefully military developments in the Arctic and in particular the modernisation of some Russian capabilities in the Arctic. We watch it carefully because obviously we have Norway as an ally up there, but we have other Arctic allies, and obviously because the access to the North Atlantic space could be challenged from the far north. So this is a very strategic region for the Alliance. We watch it carefully. And while Russia modernises its equipment and its basing in that area, we don’t yet consider it a severe challenge to the alliance. And in no small part that’s because of allies like Norway. 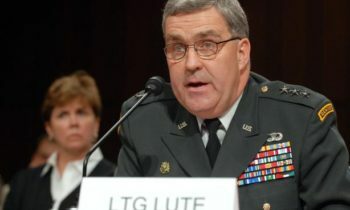 Ambassador Douglas Lute , U.S. Permanent Representative to NATO. Moderator: Today we’re very pleased to welcome once again from Brussels Ambassador Douglas Lute, the U.S. Permanent Representative to NATO. As you know, this week is the NATO Defence Ministerial, so this is a very timely conversation and I’m sure you have many questions. And thanks again to Ambassador Lute for taking the time to preview the Ministerial. We’ll begin today’s call with opening remarks from Ambassador Lute and then we will turn over to your questions and obviously we’ll try to get to as many questions as we can during the time that we have here, about one hour. 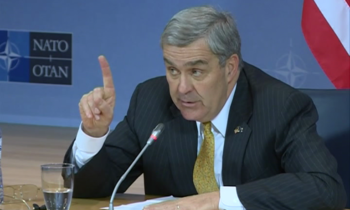 As a reminder, today’s call is on the record, and with that I’ll turn it over now to Ambassador Lute. Ambassador Lute: Thanks, Peter, and welcome all to this call. This of course follows the tradition that we’ve established over the years where just a day or so prior to Ministers, either Defense Ministers as in this case, or Foreign Ministers meeting here in Brussels we tend to give this sort of background briefing so that the informed media have a chance to understand what the sessions are all about and report accurately. Let me place first of all the next two days in the broader context and then I’ll unpack the sessions of the Ministerial itself. First of all, it’s important to recognize that this Ministerial falls almost exactly five months to the Warsaw Summit in July, and of course in NATO we use these Ministerial sessions as key milestones that tee up decisions for leaders at the Summit and shape the Summit outcomes. So we have three such Ministerials between now and Warsaw. The next two days, so Wednesday and Thursday of this week Secretary of Defense Carter will be here with his 27 Defense Minister colleagues. Then in May, Secretary Kerry will be here with his Foreign Minister friends. And back again in June will be the Defense Ministers. So February, May and June lead to the Summit in Warsaw in July. So let me quickly explain the agenda over the next two days and then we’ll get to your questions. There will be a total of five sessions on Wednesday and Thursday. The first session centers on a topic which is really essential for the Alliance and that is deterrence and defense. And what we expect Ministers to do is to first discuss and ultimately approve a new framework for NATO deterrence and defense. You might call this 21st Century deterrence. I say that because deterrence, of course, is not new to the NATO Alliance, but what Ministers will discuss over the next two days and in particular in this first session tomorrow, will be how do we update or modernize deterrence so that it is fits the purpose for the new challenges that NATO faces around its periphery. I think the way to think about the updated or modern deterrence is along a spectrum of capabilities. So on one end of the spectrum you have national defense capabilities, capabilities that each of the 28 allies have to defend themselves, to improve their national resilience, to hybrid attack, to cyber attack, to attacks on key infrastructure. In the middle of the spectrum you have conventional capabilities. These are capabilities that NATO traditionally offers in support of the 28 allies. So these are collective defense capabilities. Prominently here the Readiness Action Plan which was adopted at Wales fits into this center part of the spectrum, but other capabilities as well. So NATO’s ballistic missile defense capabilities are part of our conventional deterrence spectrum; NATO’s command and control capabilities and so forth. 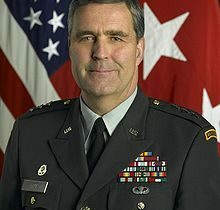 Then finally on the opposite extreme of the spectrum are NATO’s nuclear capabilities, and these are both capabilities that are operated by NATO itself, but also ultimately backstopped by the national strategic nuclear capabilities of our three strategic nuclear allies, so the United States, France and Great Britain. So if you think about deterrence, all the way from sort of national responsibilities for resilience all the way through nuclear capabilities you get a sense of the full range of the discussion in this first session. I think a very prominent contribution to that deterrence was the U.S. announcement just a week ago that in the coming year we will increase by four-fold the U.S. commitment in finances to bolstering our contribution to deterrence here in Europe. It really has three major parts, and these include first of all we will increase U.S. troop rotations to Europe. Over the last two years, just to put this in comparison, over the last two years we have rotated one armored brigade at a time for about one six-month period, each of the last two years. So for about six months we’ve had an armored brigade from the United States come to Europe and train and exercise alongside our allies. The initiative that was announced last week will double that presence. So beginning next year we’ll have an armored brigade on the ground rotating from the States for the full year. So we’ve essentially doubled our presence from the States. The second thing, and I think the thing that got a lot of press last week, is that the United States will fund a substantial set of prepositioned warfighting equipment here in Europe. Of course this is not unfamiliar to our Western European allies who hosted a lot of such equipment during the Cold War, but what we announced last week will bring a division headquarters prepositioned into Europe. It will bring an armored brigade set of equipment prepositioned into Europe. It will bring an artillery brigade back into Europe. And it will bring another set of enablers. These are supporting capabilities that go with a division set. So we’re in a very substantial way prepositioning equipment which facilitates our rapid response to Europe if we need to in the face of a crisis. And the basic design here, of course, is preposition the equipment now which enables flying in U.S. troops from the United States as needed in the face of a crisis. This of course is all in accordance with the NATO-Russia Founding Act. Some would claim otherwise, but they’re frankly wrong. The NATO-Russia Founding Act allows for improvements in infrastructure such as this prepositioning that I’ve outlined. These are rotational troops that I’ve described, not permanent troops. And the majority of the prepositioning will be in Western Europe, not in the East. So once again, this is an important move, but it’s a move that’s in accordance with the NATO-Russia Founding Act, and that of course demonstrates that NATO intends to abide by its international commitments even perhaps when others do not. I think that pretty much covers the first meeting. If the first meeting had a single title it would be modern deterrence. In the second session, the Ministers will go through a tailored discussion which is focused on NATO political decision-making. So they’ll address a fictitious scenario and by way of using this scenario as a vehicle they’ll go through the decision-making processes, both here at NATO headquarters driven by the scenario, but also decision-making that will take place in national capitals across the Alliance. And the whole idea here is to review the process so we’re all on the same sheet of music in terms of how the Alliance collectively deals with crisis; but also to look for rough spots and spots where we could streamline procedures or delegate responsibilities in an effort to speed and make more efficient our response. So that’s the second session. At the working dinner tomorrow night, the Ministers will take on the discussion of NATO’s periphery, and in particular the instabilities in the East and the South. Here very much the conversation will focus on NATO’s partners. And as many of the callers will understand, beyond the 29 members of the Alliance NATO has established and maintained partnerships with 40 additional countries. Those countries largely live along NATO’s Eastern and Southern boundaries. Here, of course, I think the theme of the last several years is increased instability and uncertainty along that periphery and among many of the partner states that NATO is associated with. So the question at dinner will be what more can NATO do to promote stability there? And essentially to export security or promote security on its borders. At this session we’ll invite five key partners to actually participate at the Ministers’ level in the discussion. So Finland, Sweden, Australia, Jordan and Georgia will actually be at the table alongside the EU as well, joining the 28 NATO Ministers in this conversation. Thursday morning dawns with a session and we’re back onto deterrence. This session is designed to be a follow-up from the Wednesday sessions, so the framework for deterrence and then the scenario discussion on decision-making. And Ministers will focus in on concrete steps they can take between Thursday and the Warsaw Summit that will bolster the spectrum of deterrence. The sorts of things I think that we imagine they’ll talk about are NATO’s ability to respond to hybrid warfare. I believe they’ll talk about national responsibilities for resilience. This includes cyber defense and national defense capabilities and so forth. 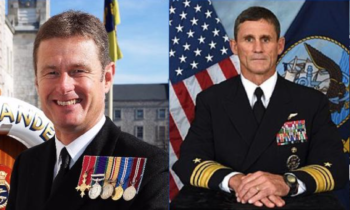 Ministers will note progress on two key NATO capabilities that are coming on-line. First of all, ballistic missile defense; and second, what we call the Alliance Ground Surveillance system or AGS. This is the first time the Alliance will own and operate five Global Hawk unmanned aerial vehicles which are high altitude, long endurance surveillance platforms. And the first of those are coming on-line between now and the Summit. So all of these capabilities will be reviewed but in this session on Thursday morning Ministers will get down into the details and try to press the Alliance to deliver as much as possible by the Warsaw Summit. Now none of this comes cheap, which means that Ministers will also review progress since the Wales pledge on defense investment on the Alliance’s ability to turn around the longstanding pattern on declining defense budgets. And the good news here, as revealed by the Secretary General’s annual report which just came out a week or so ago, is that by and large the Alliance has turned the corner on defense spending. Of course the U.S. from a national perspective, the U.S. will actually increase its defense budget next year in real terms, but not all allies have done that. About two-thirds of the 28 allies have stopped the cuts and are now moving in a positive direction on defense spending. We will actually distribute progress charts to the Ministers so there will be no hiding from the data. We’ll be quite transparent and mature about sharing openly the data on defense spending. And this, of course, is a prelude to exactly the same pattern that will play out at the Warsaw Summit when again leaders will look very candidly at how we’re doing on defense spending. The last session, so session number five, this is now before lunch on Thursday, will be a meeting of the NATO-Georgia Commission. 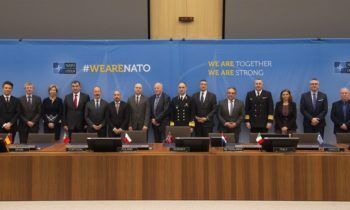 Here the 28 NATO Ministers will be joined by their Georgian Minister of Defense colleague, Minister Khidasheli. They will review progress on ongoing partnership progress with our close partner Georgia, and they’ll also assess what more might be done in the coming months. So that’s a quick survey of the five sessions. Separate and distinct. So after the NATO Defense Ministers meeting, Secretary Carter here at NATO headquarters will host a group of the Counter-ISIL or the Counter-Da’esh International Coalition. Now let me be clear that this is not a NATO meeting. It’s simply a meeting that NATO is helping by providing the venue. It will be a U.S.-hosted, U.S.-chaired meeting of coalition members, and there the discussion will be what more needs to be done in terms of generating the resources required to increase the pressure against Da’esh. That will take place on Thursday afternoon. Press: I wondered, with respect to the deterrence of 21st century and the announcement that was made last week. So in which Central European countries the U.S. wants to deploy military equipment? It is Poland or do you consider other Central European countries like Hungary? Ambassador Lute: This is a bit of a difficult question because there are several different sets of U.S. equipment that will be prepositioned, so let me see if I can clarify. You’ll recall that last summer we announced that we were distributing training equipment across a number of Central and Eastern European allied countries to facilitate American troops coming in, training with our allies, and having the equipment already there prepositioned. So that prepositioning of rather small training sets is underway now. I think there are six or eight countries where we’re working with the host government first of all to secure an invitation. The United States doesn’t put combat equipment on another country’s territory without an invitation. But with that host nation invitation we also then have to negotiate things like the facility where the equipment will be stored securely and so forth. So that process is going on and it’s been going on now for about six or nine months. The equipment that was announced last week, however, is a different set. This set will not routinely be used for training but will be stored mostly in Western European allied countries along transportation nodes where the sets can be quickly linked up with troops from the States and then moved in any direction — north, south, east or west — based on the transportation infrastructure. So there’s a set of equipment that’s being prepositioned. It’s relatively small and for training purposes. And there’s another set, the set announced last week, which is essentially for crisis purposes and that will be preserved for actual potential of combat. As for whether or not there will be some in Hungary itself, you know I’m not up to date with the exact negotiations that are taking place, but I know Hungary is a candidate state to receive some of the first type, that is a relatively small training set. But I can’t tell you on this call exactly what the status of that negotiation is. But certainly Hungary is a candidate. Press: I would like to learn the U.S. perspective since there was a call between Merkel and Davutoğlu, the Turkish PM, Davutoğlu, that they were asking for now from NATO in the southern border and in agency for the Coast Guard ? Secondly, since the Patriots that the U.S. and Germany has deployed to Turkey has been withdrawn, is there any new decision on the agenda of NATO members to deploy AWACS or other items like the missiles, SAM missiles ? Ambassador Lute: Let me take those in reverse order. First of all, the Alliance agreed several months ago in response to a Turkish government request to provide Turkey additional self-defense capabilities, and capabilities that reassure Turkey that if its borders are violated that the Alliance will stand strong with Turkey, and those capabilities are moving in, they’re either in Turkey now or they’re about to be in Turkey. I don’t know of a new request for additional such NATO support, but those, we call them reassurance capabilities, are en-route. Now having to do with the press reports from yesterday between Chancellor Merkel and Turkish leaders, I read those too, but they have not been formalized yet, although they might be in the next two days. So we’ll have to simply see what transpires during the Ministers meeting and there will be space, and of course Ministerial meetings are a prime opportunity for any one of the 28 allies to bring such requests to the Alliance. But quite candidly, we’ll have to just see what either the German or the Turkish Ministers have to say on this matter. So all I can say is I’ve seen the press reports and I await their comments in the next two days. Ambassador Lute: The question is correct, that there is money in the budget decision announced last week to build capacity among Eastern and Central European allies and also partners, so beyond allies to partners themselves. So how much of the $3.4 will go to which particular ally or which particular partner has not yet been decided, but there is a portion of the $3.4 billion devoted to partner capacity building. I don’t have the details. Those are yet to be worked out. And of course this is money that plays out over the next year. But what I can tell you is that one of the priorities of the funding decision was to build partner capacity. Press: — said that the U.S. had to choose between Turkey and Syrian Kurdish forms of PYD which he referred to as terrorists. This is following the visit to Kobani by U.S. Envoy Brett McGurk. What is your response to this apparent ultimatum? Ambassador Lute: First of all we’ve been in close negotiations and closed conversations with our ally Turkey for a long time, having to do with U.S. support for different Syrian opposition groups inside Syria. And part of that discussion has admittedly been about the role that the Syrian Kurdish groups but other Kurdish groups play with regard to the struggle in Syria. So I’ve seen the reports that Turkish officials have registered concerns, but these are not new concerns with regard to U.S. contact and U.S. support for the Syrian Kurdish groups. And of course the visit that you’re referring to took place into the town of Kobani which of course was largely freed from ISIL control because of the fighting, because of the effective fighting of those Syrian Kurdish groups. So this is an ongoing matter of conversation, of consultation between the United States and Turkey, and I think I’ll just leave that to play out in diplomatic channels. Press: There are now almost daily reports of civilian casualties after Russian air strikes in Syria. We also see thousands of new refugees every day heading to Europe after this. Basically, what will NATO’s response to this emerging situation be, and why is Russia doing this? Also, another question connected to this one. Last time we spoke, you said Russia is concentrating its actions only against the Syrian opposition, not against ISIS. Has this changed at all in the past month? Thank you. opposing the Syrian regime, those opposing Asad. They are not against ISIL. And this is an empirical fact. I mean this is not an estimate, this is knowable. And what we know is that Russia is bombing the opposition in Syria and not taking the fight to ISIL. Now what are the impacts of that move? The impacts are that the situation is complicated dramatically by Russia’s actions in at least three ways. So first of all, the security situation is complicated; second of all, as you mentioned, the humanitarian situation is complicated because the Russian bombing campaign in Northwest Syria has dramatically increased the refugee flow. We’ve seen these refugees displaced not only inside Syria itself, but also along the border with Turkey and into Turkey. So they’ve worsened the humanitarian situation. Finally, as I think we saw play out in Geneva in the UN-hosted emerging political process, Russia’s actions on the ground dramatically complicate the politics. So on all three fronts — the security front, the humanitarian front and the political front — we see Russia’s continued focus on these opposition groups in support of Asad as unhelpful and not constructive. So why are they doing this? I think we can only draw one conclusion. That is that their objective is to promote Asad and to sustain his position in power in Syria. So the situation has not improved, but I would argue has worsened since our last media call in December. Press: I’m following what you just mentioned regarding Russia’s role in the Syrian conflict. Does it make any sense to meet Thursday night in Munich to go on with ceasefire negotiations in the Geneva format? Give us an outlook on these negotiations, please. And a second question, if I may. There was a discussion to bring NATO airplanes over Syria, into Syrian airspace, and over Turkish airspace. Could you please give us an update? Ambassador Lute: First on the political track. I would say it’s the only thing that makes sense. Now the politics of this, the diplomacy of this will be difficult. The UN has one of its best negotiators, one of its best international diplomats on this case, Steffan de Mistura, working for the UN Secretary General. And it will be an extremely difficult process, but it’s the only process that makes sense because we don’t believe that there’s a military solution. So if we search for a solution we’re led immediately to the political and the diplomatic track. So I appreciate that we’re in the early days of this political effort, in this diplomatic effort, but it’s really an effort that deserves all of our support. As for the NATO AWACS, there is an ongoing process where NATO is assessing whether it might provide support to the coalition against ISIL, but the forms of that support and the timing and how that might actually happen is still under discussion, and of course for those on the call, AWACS is an airborne essentially air traffic control aircraft from which air campaigns can be commanded and controlled. NATO has this capability. Nations also have this capability, so the United States, for example, has this capability. And there is a request asking NATO to assess whether it could lend some of its capabilities in support of the coalition. That’s the request that is still under consideration and no decision has been taken. Press: What do you think is Russia’s long-term ambition with Syria? There’s a question that’s rumored in Sweden that Russian authorities are aiding refugees to enter Europe, and some people see that as an effort to destabilize the union. Is there anything behind this those rumors that we can be certain of? And you are talking about deploying in Europe, is there anything coming to Sweden ? Ambassador Lute: I think Russia’s objective in Syria is to keep Asad in power and therefore retain Russian influence in the region. Because of Russia’s longstanding historical relationship with the Asad regime, both under Bashar al Asad and previously under his father. And of course Russia has a naval base in Tartus. It now has a significant air presence just north of there in a Syrian base. So this has, I think, everything to do with retaining, preserving Russian influence in the region. But also I think there’s evidence that Russia wishes to be a player, wishes to assert itself on the international scene and have a voice in the affairs in the Middle East. That appears to be Russia’s objective. What appears not to be an objective is the fight against ISIL, and this I base simply on the empirical data that shows who Russia is fighting — that is the opposition — and who Russia largely is not fighting — and that’s ISIL. With regard to Sweden, NATO has obviously one of its closest partnerships with Sweden. This, in part, is why Sweden will at the Ministers level be invited to join the NATO Ministers at dinner tomorrow night. And one of the things we wish to get out of that conversation with our Swedish colleague is how does partnership look from outside NATO? So how does a partnership with NATO look from a country like Sweden who has over the years operated right alongside NATO in contingency operations in the Balkans and in Afghanistan, and how could NATO, what steps could NATO take to actually improve partnerships from a partner’s perspective? So this is why tomorrow night we’re anxious to hear from the set of five partners that I mentioned, including Sweden, about how we can actually improve partnerships, because from NATO’s perspective, partnerships are going to be even more vital in the coming years as we the Alliance deals with this instability along its periphery. I think there was one other question but I missed it. Can you review, is there a third part of your question? Press: Russian authorities aiding refugees in a destabilizing effort ? 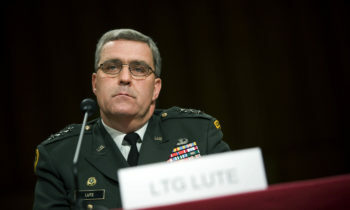 Ambassador Lute: I’ve seen press reports about this point, but I have not seen evidence of this, hard evidence of this. I think that the number one thing that Russia is doing with regard to refugees out of Syria and Iraq is continuing the strikes in and around Syrian population centers in Northwest Syria and supporting the Asad regime. After all, it’s the Asad regime which is the number one source of the displaced persons and refugee crisis. I mean, the humanitarian situation among Syrians has been promoted by the Syrian government. So when the Russians align themselves with Asad, and when the Russians take the fight in and round Syrian population centers, all they do is make more severe the humanitarian crisis which brought a million refugees to European shores last year. So I think the real problem with regard to Russia and refugees, we should focus on the source of the problem, and the source of the problem is the violence in Syria. Press: My question is about the Russian Defense Minister latest Turkish airspace violation and insists the plane never entered Turkish airspace. However, Turkish government strongly insists that the Russian airplane entered into Turkish airspace and condemned it. Is NATO [inaudible]. What sort of physical and technical information do you have on this issue and what’s your comment on it? bases have moved up along the border with Turkey and in several cases have actually crossed the border and violated Turkish airspace. And of course we all remember back before the end of the year, I believe in November of last year, that one of these violations led to Turkish F-16s actually downing a Russian combat aircraft. So the incident of just a week or so ago is only the latest in a pattern, which we should remember. NATO has its own means of verifying the tracks of aircraft in the region and as Turkey provided its evidence, NATO tracked Turkey’s evidence with our evidence and we corroborate the Turkish evidence. So NATO and Turkey see this exactly the same way. We agree that the Russian aircraft violated Turkish airspace and we agree that Turkey warned the aircraft repeatedly before the violation. Now the burden should shift to Russia. And what we need is a Russian decision to stop these dangerous activities right up along the border with Turkey and to ensure that it abides by safe flying practices which are well-established between Russia and the others who are operating in that area. So there’s a real burden here on Russia to take the right safety measures to ensure the safety of its pilots but also to ensure the safety of other pilots in the area, and frankly to ensure that we don’t have another dangerous situation where actually shots are filed. Press: what is the U.S. position on Turkey refusing Russian flights over its territory and the treaty on Open Skies ? And another one, General Secretary Jens Stoltenberg said that the possibility of a meeting of the NATO-Russia Council is under discussion. Does the United States support this idea? Ambassador Lute: Your first question had to do with, I believe, the recent request by Russia to assert its privilege under the Open Skies Agreement and fly along the Turkish border. By longstanding agreement, the Open Skies flights have to be mutually agreed by both parties, and as I understand it in this case we did not have mutual agreement, so therefore the flight was denied. But that’s not unusual. That’s longstanding protocol in the Open Skies Agreement. With regard to the Secretary General’s comment with regard to the NATO-Russia Council, you’re right. 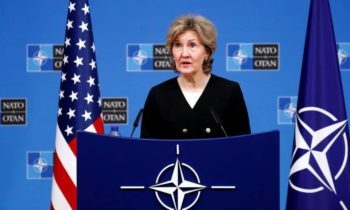 Such a meeting is being explored by both sides, by both NATO and by the Russian authorities, and the United States supports the potential that the NATO-Russia Council meets, however we’re quite clear that this is not actually out of the ordinary. This is an agreement that’s been in place for some months now, that we should retain the openness to dialogue at the Ambassador’s level in the NATO-Russia Council. So this is actually not news. This has been in place for some time and the United States continues to support it. Press: Turkish airspace violation as mentioned. At the same time Turkish fighter planes violate almost daily the Greek national airspace. What is the official U.S. response on that issue? Ambassador Lute: Our response is actually similar in both instances, and that is that wherever airspace of one nation meets airspace of another nation, there is a two-part responsibility to abide by international protocols, international rules with regard to that airspace. In the case of Turkish and Greek airspace, typically those questions that occasionally arise between Turkey and Greece are dealt with diplomatically. They’re dealt with in responsible channels and there’s a longstanding pattern of responsible behavior on behalf of those two allies. We would like all such airspace questions to be dealt with so responsibly as both our Turkish and Greek allies have demonstrated over the years. So there are international rules here and the U.S. position is those rules should be abided by. Press: what do you think would be the role of Romania in the new deterrent strategy that will be discussed tomorrow in Brussels? if you believe that this new budget announced by the Pentagon for the Central and Eastern European countries will be enough to deter threats like Russia? training alongside Romanian troops for years now. Romania has hosted U.S. training exercises and U.S. equipment on Romanian soil, and those are very important national steps that Romania has taken to bolster deterrence along that part of the alliance boundary. But you know, Romania has a second role, and that is the role as a contributor to the collective defense and here you see Romania’s armored forces operating outside Romania, prominently in Afghanistan for years, where they have contributed to the collective defense of the Alliance. So there’s very much a two-way street. Romania receives support and contributes as a host country, and Romania provides support to the Alliance as a whole. And that’s exactly the way the Alliance is set up. This is a two-way street between nations and the Alliance, back and forth. And Romania is a very good example of that. Press: The second part was if you believe that the new funding announced by the Pentagon, the $3.4 billion, for the countries in Eastern Europe is enough for deterring threats like Russia ? Ambassador Lute: We’re not sure that it’s enough, quite frankly, and part of the reason the President took this decision, and this is a considerable investment, $3.4 billion, part of the reason he took that is that he’s convinced that we needed to do more. Over the next two days in the face of this decision announced last week, Defense Ministers will have this very conversation. I mean, the question you just posed to me will be a question that Ministers pose to one another in the next two days. That is, are the steps that the Alliance has taken so far, to include the $3.4 billion decision, are they enough? Or rather, by the Warsaw Summit in July, are there additional concrete steps that need to be taken to further bolster this idea of modern deterrence? So I don’t have a solid answer for you except that it’s such a good question that Ministers will actually tackle it in the next two days. Ambassador Lute: First of all it’s important even as current events draw our attention to the East or to the South of NATO space, to remember that NATO is an Alliance in all directions. So here at the NATO headquarters we often remind ourselves that we are a 360 degree, that is a complete circle when we think about challenges to the Alliance. So the far north is part of that 360 degrees. Thanks to very solid allies like Norway we don’t have a serious security challenge today in the far north. NATO watches very carefully military developments in the Arctic and in particular the modernization of some Russian capabilities in the Arctic. We watch it carefully because obviously we have Norway as an ally up there, but we have other Arctic allies, and obviously because the access to the North Atlantic space could be challenged from the far north. So this is a very strategic region for the Alliance. We watch it carefully. And while Russia modernizes its equipment and its basing in that area, we don’t yet consider it a severe challenge to the alliance. And in no small part that’s because of allies like Norway. Ambassador Lute: This question obviously speaks to a conversation that is very active in the United States having to do with these offset strategies, and let me just for the listeners quickly review what this means. There is an argument that at least three times in Alliance history that significant technological gains have led to a significant shift in strategy, and historically the first such shift for NATO was the development and deterrence value of nuclear weapons. So this is back, all the way back to NATO’s founding. The second technology shift was a shift in the mid-1960s into the mid-1970s where precision conventional weapons tended to offset the nuclear stalemate. 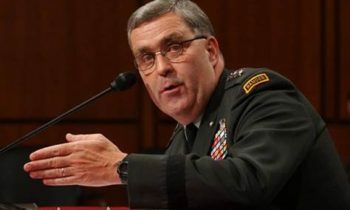 The third such strategy is now discussed among some officials as something that’s happening right now, and this is the notion of cyber capabilities, of electronic warfare capabilities, of further precision-guided capabilities, all combining to suggest that we may be at another strategic shift. One of the things that’s cited as an example of this, this third offset, if you will, is the Russian capabilities that we see deployed in Kaliningrad, for example, or increasingly in the Crimean Peninsula, where the Russian deployment combines precision-guided surface-to-surface strike capabilities; it brings sophisticated air defense capabilities; sophisticated electronic capabilities all to one place in an effort to be able to assert influence out into international sea space and international airspace. So this question of the third offset strategy is very much a topic of discussion, and I think NATO’s response to these kinds of modern capabilities is very much what we mean by 21st century deterrence. So how do we offset Russian moves? We offset it by modernizing deterrence as I described earlier in my comments that run all the way from national resilience all the way through the nuclear deterrent capability. So it’s very much a discussion that’s going on in Washington and it influences NATO thinking. Ambassador Lute: In the $3.4 billion a section of that money, a portion of that money is devoted to building partner capacity, and by partners we include states like Moldova. Now exactly what U.S. programs will go to Moldova are not yet determined, but these are programs that have to do with modernizing Moldova’s ability to defend itself, modernizing Moldova’s defense institutions and their national security structures so that Moldova is more resilient and more able to defend itself, and more able to resist outside intimidation and outside influence. So I don’t have actual program data in terms of what kinds of support will flow to Moldova, but those are the categories. Mostly having to do with making Moldova more resilient to negative influences from outside. Press: You said that you will fly in troops and equipment to the western countries in NATO. Will this, how will you position it when it comes to the borders with Sweden? Will you strengthen the positions? Where will you strengthen the position, so to speak? Ambassador Lute: The equipment that will be funded by the money announced last week will be largely prepositioned in countries in Western Europe, not near Sweden. And of course in the face of a crisis which could or could not include a crisis for Sweden, that equipment could move in any direction. But of course, somewhat hidden by your question is the reality that the equipment that’s prepositioned in Western Europe to meet the U.S. commitment to NATO does not immediately affect Sweden unless Sweden were to take a national decision with regard to membership. So it’s committed to defense of the 28, which of course could have an impact because Sweden sits on the periphery of NATO, but it doesn’t have a direct impact on Sweden.